Needing to get ready to haul a trailer, boat or want to mount a bike rack. We have a full selection of hitches from the market leader Curt MFG that will help get the job done. All are made specifically for each vehicle so installation is usually done very quickly, most installations will not require you to drill any holes. All hitches are powdered coated with a high gloss black powder coating for long lasting durability. Curt backs their product with a lifetime warranty. 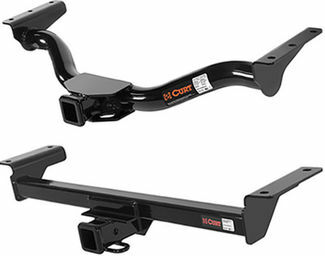 Get your vehicle ready for your next vacation, weekend trip or bike ride with a receiver hitch from Suspension Connection. What is a receiver hitch? 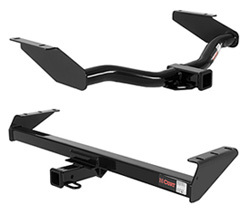 A receiver hitch is an accessory that is generally mounted to your vehicles frame near the rear bumper that allows for you to tow a trailer or attach accessories (bikes racks, cargo carriers) to the rear of your truck or car. Models are also available for the front of vehicles to allow use of winches or putting your boat into the water. Most are receiver type hitches which have a square opening to allow for use of a ball mount (or other accessory). A hitch ball can then be mounted to the ball mount, which is then connected to the coupler of your trailer. Hitches come in various sizes, shapes and rates depending on your vehicle, including applications for the front or rear of your vehicle. Some use square tube, others use round. Each have a maximum weight rating ranging from 1,000 lbs to 15,000 lbs. and have a receiver size opening ranging from 1 1/4 inches to 2 1/2 inches. 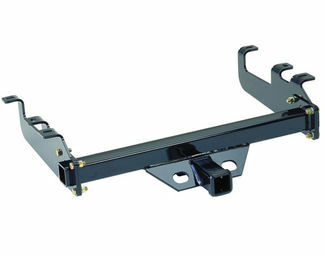 Trailer hitch classes are based on the weight rating and receiver size. 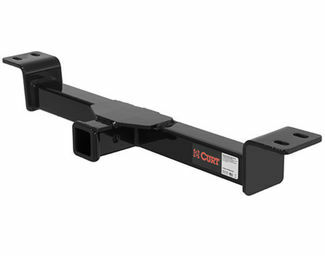 Most cars utilize a Class 1 or Class 2 hitch which have a 1 1/4 inch receiver opening and weight rating from 1,000 lbs to 2,5000 lbs. SUVs, vans and midsize trucks generally range from Class 2 (1 1/4" receiver) to Class 3 (2" receiver) with weight ratings unto 5,000 lbs. Fullsize truck applications are limited to heavier duty classifications from Class 3 to Class 5 hitches. Nobody wants to spend hours underneath their truck. Fortunately installing a receiver hitch is a simple process. All our hitches are custom fit for each vehicle. Most application use existing holes within the frame of each vehicle, so there are no holes to drill. Vehicles that do required drilling often are limited to two to four 1/2 inch to 5/8 inch holes. When installing a hitch to tow a trailer you will normally require the following items. 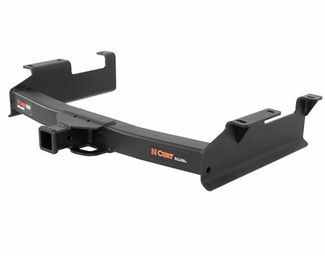 Receiver hitch, ball mount, hitch pin or lock and a wiring harness. Trailer brakes can also be required for some applications.